June 14, 2014 June 21, 2014 / Susan O. Rarely have I come across a book so haunting. If you Google Earth for North Korea at night, you will see South Korea as brightly lit as a coast of the US. Above it is a great big blackness. This is North Korea. It is not black because they block out satellites, or by treaty. It’s because there is no electricity. 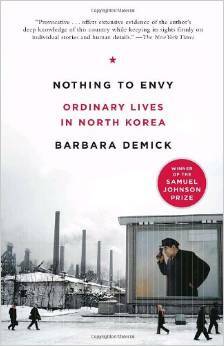 Author Barbara Dimick’s book, Nothing to Envy: Ordinary Lives in North Korea won the 2010 Samuel Booker prize, with good reason. 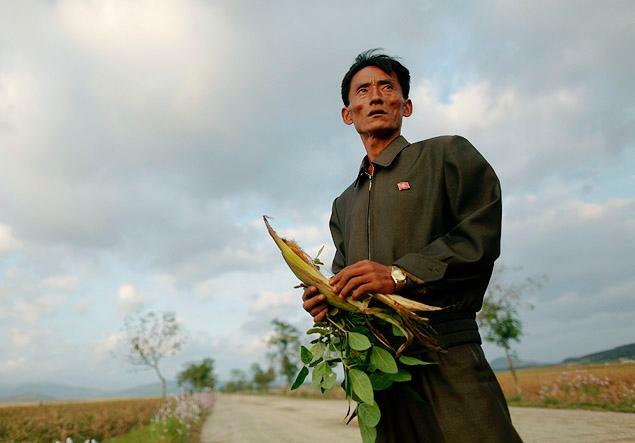 Dimick has seen the “official” places of North Korea, but moreso spent years tracking down people who managed to escape the deadly iron fist of North Korea and interviewing them extensively. She follows several families, some of them die-hard party loyalists, through their unwavering patriotism, their questioning, their suffering, to their desperate do or die escape. Dimick traces some of the history, from World War II, when things started to go flaky, through the Korean conflict, when things got really wacky, to the insane tyranny of Kim Jong Il, and now Kim Jong Un. North Korea, until the 1960’s, actually had a better standard of living than South Korea, but began to fall apart in the 70’s. But, unlike Russian Communism, instead of saving itself, North Korea became even more hard-nosed, more dictatorial, more insane. By the 90’s, there were no jobs, no wages, no food, no manufacturing. People began starving to death in great masses, with children so stunted by malnutrition they barely topped 4’7” as adults. Trees died, because people stripped the bark to eat. As many as three million people died, and there were many reports of cannibalism. Imagine a place where radios and televisions are set by the government to one single official channel. Where the government doles out the very food you are allowed to eat, and the quantity, and the clothes you wear. Where everything is in black and white except the propaganda posters, which are in red, the only color people can look to with cheer. Where every home must display a photo of the dictator, and clean it daily with a special cloth, where the picture can be inspected at any time and you can be sent to the Gulag for disrespect. North Koreans are so isolated, so indoctrinated, so starved, so cowed, that they are not only utterly brainwashed against the outside world, but cannot imagine what the outside world is like. After three generations of this, they’ve never known anything else. Perhaps the saddest, most poignant moment is when the once-loyal mother makes a desperate swim across the river into China, crawls to the first house she sees, starved, frozen, exhausted, desperate, pushes open the garden gate, and discovers a bowl of meat and rice and vegetables set outside waiting for her, and she is utterly amazed, not having seen meat or even rice in months. Then the family’s dog comes around the corner of the house, and the woman realizes that in China, even dogs eat better than North Koreans. Read this. Really, read this book. It’s short. It will painlessly explain so much of the insanity, the politics, the danger that is North Korea, and will help you separate the Korean government from the Korean people, who have as much control over their situation as an ant has over an elephant. You will not forget it.